I should admit right from the off that I’m both overweight and pretty unfit so this is most certainly not one of those motivational, expert, gym-bunny posts. However I did want to share my recent experience of using exercise for a healthier mind, as well as (hopefully!) a healthier body. During my PND experience very long walks were really helpful in keeping me going during those early stages of recovery. Back then I also attended an Active Mums class – an aerobics session where you could bring your baby along too. That hour a week was a great anxiety release and mood-booster. Under the encouragement of some great friends, I’ve decided to return to exercise to help with my recent struggles and I’m so glad I have; it’s really helping with my anxiety and my emotional wellbeing. I’ve always been sceptical about articles that credit exercise with being such a cure-all for mental health but I’m happy to swallow my words. So why is exercise so helpful for our minds? This sounds a bit strange but I’ve found that sitting at home dwelling on how I feel only makes me feel worse. Finding something to occupy our minds, bodies or both is really important. When you’re struggling the days can feel desperately long and giving yourself a regular activity at least a couple of times a week can only be a good thing. Hello, broken record. I know I don’t stop talking about self-care but that’s because it’s so important. Exercise classes are another opportunity to take some much needed time for yourself. Looking for more self-care inspiration? Check out the random selection of activities in my post How Do You Self-Care? I’ve been practicing being present and mindfulness a lot more this time around and it’s a fantastic way to relieve anxiety (although it does require a lot of practice). Exercising a good opportunity for mindfulness as there are plenty of things to focus on and keep you in the moment – the sensations in your body, the music, the heat etc. For more tips on mindfulness & exercise sign up to mindful meditations from Headspace. Sometimes being around other people, especially new people, can be really daunting when you’re not feeling well but it’s also very important if you can manage it. 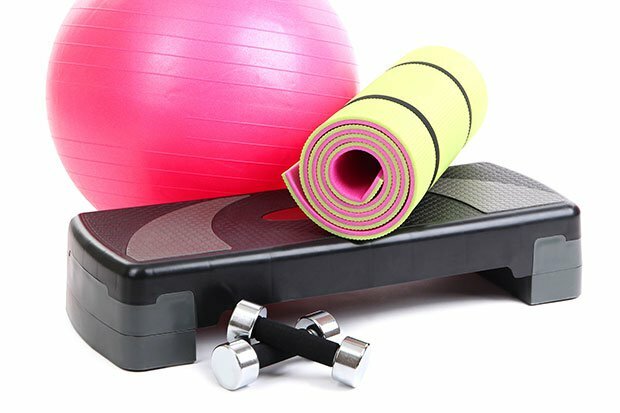 Exercising with a friend is perfect as it’s a great way to distract you and potentially lift your mood, but if you don’t have any friends willing to go along with you, even being in a room with others and engaging with them a little can help take you outside of your mind for a short while. The classes I’ve been attending are part of the Active Women programme run by my local council. I understand there are similar schemes running throughout the country and as an added bonus and many of the classes are free! As my mind continues to become clearer and healthier again I hope I can still find the motivation to exercise for the sake of my body and health too. Watch this space I suppose! For further info re using exercise to cope with Anxiety, watch this video on the topic. Thank you for the article. As one who has had her own challenges with mental illness, I’ve found a lot of relief in exercise as well. Not everybody is gym-going type, but some gyms like Kubex do a lot to reduce the anxiety that some people get just from going to the gym.